BEIJING (AP) — Rescue workers cleared roads Saturday so they could search for survivors and rush aid to a remote mountainous area of southwestern China after twin earthquakes killed at least 80 people. More than 200,000 villagers were evacuated after Friday's quakes toppled thousands of homes and sent boulders cascading across roads in a region of small farms and mines near the border between Guizhou and Yunnan provinces, where some of China's poorest people live. All but one of the deaths occurred in Yiliang County, according to the Yunnan provincial government's official website. Yiliang's high population density — twice the provincial average — along with flimsy building construction and landslide-prone hillsides were blamed for the relatively high death toll. 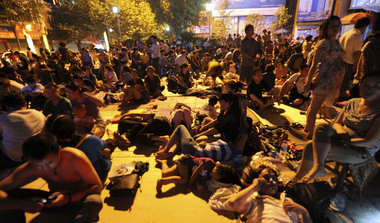 Yunnan's civil affairs department said Friday's quakes destroyed 6,650 houses and damaged 430,000 others. It said direct economic losses in Yunnan so far are estimated at 3.5 billion yuan ($551 million). Friday's quakes were relatively shallow, about 10 kilometers (six miles) deep, creating an intense shaking despite their moderate magnitude.